I’m not a gamer and have never actually played a Zelda game. So, why on Earth did I request this book from NetGalley? Growing up, I watched my younger brother and sister play Ocarina of Time, Twilight Princess, and Majora’s Mask. Later on, I watched videos of someone playing Skyward Sword so I could tell my husband what to do next. Since then, we’ve accumulated Link costumes for my husband and son, my husband’s Master Sword and Hylian shield, and at least a couple of Link figurines. My son picked out one of those figures as a present from us when his sister was born. My husband is very proud that our son is a fan of The Legend of Zelda series. I’m not unfamiliar with the series, but have never played it myself. I’m almost as far from being a gamer as I could possibly get. But my background is in psychology. So, when I saw this book, I couldn’t pass up the opportunity to request it. And maybe figure out why the people I love enjoy these games so much. Unfortunately, not being a gamer and having never personally played the games, I struggled to connect with what the authors were saying about why the games are so popular and compelling. Having never played, I don’t have the ability to understand the connection the player is meant to create with Link, according to the various authors. I’ll have to leave it up to those who have played the game to say whether they actually formed a bond with Link or not. I like watching players solve the puzzles and my husband freely admits he loves the games for the puzzles, so I struggle with understanding how Link is actually relateable. 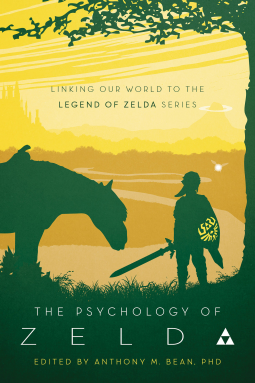 But I did love that almost all of the authors come from a psychology background and are actively engaged in research with video games and the people who play them. Even though I struggled with what they presented, I appreciated that they are experts in the field and it’s easier for me to accept that it must be true. Many of the of the chapters are heavily focused on Carl Jung and his archetypes (Hero, Villan, etc.). I’m not unfamiliar with Jung, but he’s not someone I really studied as many of my professors actually considered him outdated, though that may also be because my studies were more clinical and talk about archetypes doesn’t seem to be commonly done with people with, say, schizophrenia and anger issues. While it was interesting to see how the authors linked the games with Jung’s ideas, it did get a little repetitive and, by the third chapter, I was ready to never, ever hear Jung again. Fortunately, not all of the chapters focused on Jung. There was a particularly interesting one about the Hero’s Journey and another that focused on the masculine and feminine attributes. But the ones that made the most sense to me were the ones about Majora’s Mask. As a gamer, I think I probably would have been frustrated and, considering how easily frustrated my brother gets while playing, I’m glad I wasn’t home for much of his game play for that one. As a student of psychology, I was fascinated. How the game was created made complete sense, and I often wondered throughout my reading of this book if the game developers had psychology in mind when they created it. Overall, I found this book quite interesting. There were several pieces that I can never fully understand and will have to leave it to someone who has actually played the games to see if it rings true or not. My husband is currently reading it and he is really enjoying it. So, maybe it is true. It was fascinating to see how the games have evolved over time to more closely reflect current society, but there is still a long way for them to go before it’s an accurate mirror. So, how many cups of tea will you need? Whether you’re a gamer or not, this book is interesting. I’ll have to go with 4 cups of tea despite my struggles. Thank you so much to NetGalley and the publisher for a free copy of this book. It was published on February 19, 2019. All opinions expressed here are my own and my husband’s. This entry was posted in Reviews and tagged Book review, netgalley, Psychology, The Legend of Zelda, ThePsychologyofZelda, video game. Bookmark the permalink. I’ve never played myself, but I’m tempted to ask someone to play Majora’s Mask so I can see if it’s true. It sounds equally intriguing and frustrating. My son has Wind Waker …or Walker and it talks about it. I doubt I’ll ever play Majora’s Mask so I’ll read up on it.